through its life will be properly informed on appliance use and safety. • Keep all packaging well away from children. There is risk of suffocation. service personnel to avoid hazard. suitable for household room illumination. appliance, because they may explode. 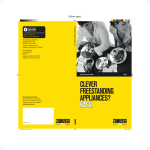 • Appliance's manufacturers storage recommendations should be strictly adhered to. drain. If the drain is blocked, water will collect in the bottom of the appliance. the instructions relevant to installation. after the installation of the appliance. ther its refrigerant circuit or insulation materials. with the urban refuse and rubbish. The insulation foam contains flammable gases: the appliance shall be disposed according to the applicable regulations to obtain from your local authorities. Avoid damaging the cooling unit, especially at the rear near the heat exchanger. the location of the appliance. the compressor. This is correct. the temperature regulator. This is correct. so a saving in electricity consumption. be covered and may be placed on any shelf. Fruit and vegetables: these should be thoroughly cleaned and placed in the special drawer(s) provided. should be stored in the bottle rack on the door. its cooling unit; maintenance and recharging must therefore only be carried out by authorized technicians. surface and leave a strong odour. brush. This operation will improve the performance of the appliance and save electricity consumption. a little washing-up liquid added. is no voltage in the mains socket. Water flows on the ground. The temperature in the appliance is too low. 3. Remove the lamp cover (2). power and specifically designed for domestic appliances only. gaskets. Contact the Service Center. The technical information are situated in the rating plate on the internal left side of the appliance and in the energy label. Caution! Read the "Safety Information"
should these safety measures not be observed. fuse in the plug supplied, a 13 amp ASTA approved (BS 1362) fuse must be used. hazard. Ensure that it is disposed of safely. noise of the appliance during operation. To adjust the height of the appliance loosen or tighten the two adjustable front feet. doors of the appliance during the operations. • Remove the plinth (1). • Unscrew the hinge (3) and remove the door. • Refit and screw both lower hinges. • Refit the plinth (8). • Unscrew the handle (1) and fix it on the opposite side (2). side edge of the appliance.